In this tutorial you will learn how to get or set dimensions of an element's box such as width and height using jQuery. jQuery provides several methods, such as height(), innerHeight(), outerHeight(), width(), innerWidth() and outerWidth() to get and set the CSS dimensions for the elements. Check out the following illustration to understand how these methods are calculating the dimensions of an element's box. The jQuery width() and height() methods get or set the width and the height of the element respectively. This width and height doesn't include padding, border and margin on the element. The following example will return the width and height of a <div> element. Similarly, you can set the width and height of the element by including the value as a parameter within the width() and height() method. The value can be either a string (number and unit e.g. 100px, 20em, etc.) or a number. The following example will set the width of a <div> element to 400 pixels and height to 300 pixels respectively. Note: Use the jQuery width() or height() method if you want to use an element's width or height in a mathematical calculation, since it returns the width and height property value as a unit-less pixel value (e.g. 400). Whereas, the css("width") or css("height") methods returns value with units (e.g. 400px). The jQuery innerWidth() and innerHeight() methods get or set the inner width and the inner height of the element respectively. 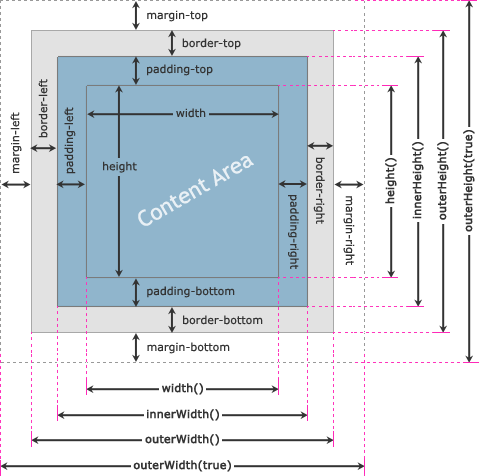 This inner width and height includes the padding but excludes border and margin on the element. The following example will return the inner width and height of a <div> element on the click of a button. Similarly, you can set the element's inner width and height by passing the value as a parameter to the innerWidth() and innerHeight() method. These methods only alter the width or height of the element's content area to match the specified value. For example, if the current width of the element is 300 pixels and the sum of the left and right padding is equal to 50 pixels than the new width of the element after setting the inner width to 400 pixels is 350 pixels i.e. New Width = Inner Width - Horizontal Padding. Similarly, you can estimate the change in height while setting the inner height. The jQuery outerWidth() and outerHeight() methods get or set the outer width and the outer height of the element respectively. This outer width and height includes padding and border but excludes the margin on the element. The following example will return the outer width and height of a <div> element on the click of a button. You can also get the outer width and height that includes padding and border as well as the margin of the element. For that just specify the true parameter for the outer width methods, like outerWidth(true) and outerHeight(true). Similarly, you can set the element's outer width and height by passing the value as a parameter to the outerWidth() and outerHeight() methods. These methods only alter the width or height of the element's content area to match the specified value, like the innerWidth() and innerHeight() methods. For example, if the current width of the element is 300 pixels, and the sum of the left and right padding is equal to 50 pixels, and the sum of the width of the left and right border is 20 pixels than the new width of the element after setting the outer width to 400 pixels is 330 pixels i.e. New Width = Outer Width - (Horizontal Padding + Horizontal Border). Similarly, you can estimate the change in height while setting the outer height.